Thai Yoga Massage is a comprehensive and therapeutic movement and massage practice that has its roots in the well-being practices of Ayurveda and has been evolved over centuries in Thailand. Thai Yoga Massage is practiced fully clothed on a floor mat and combines assisted stretches, massage, acupressure, energy work, and meditation. Highly beneficial for both the client and the practitioner, this is a method gaining in popularity for its therapeutic benefits and deep relaxation. In this 3 hour introduction to the practice of Thai Yoga Massage you will explore the foundations of the practice, and learn, give and receive a 20 minute sequence that you can take home to share with others. A 5-day training where you will study, practice, receive, and learn to give a comprehensive 90 minute massage. Ideal for yoga students and teachers, fitness professionals and bodyworkers, or anyone wishing to share the power of touch. Have a dynamic healing career in just 10 days with the Essential Level Certification, or advance your practice with Intermediate and Advanced levels of Certification. Yoga Trinity offers comprehensive training in Thai Yoga Massage both for personal development and professional accreditation, and is the only Lotus Palm and Still Light certified school in Australia. Courses include study, practice, and experience not only in giving a skillful and highly beneficial massage, but also in cultivating a successful and rewarding professional Thai Yoga Massage practice. Yoga Trinity Thai Yoga Massage courses emphasize using the least amount of effort to achieve maximum results. Training focuses on the skilful use of proper alignment, body mechanics and positioning of the practitioner. There is strong emphasis on safety and on easy, flowing transitions from one posture to the next. Perhaps the most vital element in the practice of Thai Yoga Massage is to bring a spirit of Metta – unconditional love and compassion – to your work. Every posture, every movement is built from this core. We adhere to an integrated approach that honours the traditions of Thai Massage and establishes its Indian Ayurvedic heritage but which aims to blend the strengths of both Eastern and Western approaches to healthy living. As such special attention is given to the effects of the massage on the skeletal, circulatory, muscular and nervous system. Yoga Trinity teaches a form of Thai Yoga Massage that caters to the tastes and demands of modern life, taking into consideration how people tend to overuse their back, neck and shoulders and wish for considerably more attention to those general areas. A 3-hour workshop where you will explore the foundations of Thai Yoga Massage and learn a 20 minute sequence that you can share. Ideal for anyone wishing to have an introduction to Thai Yoga Massage to share with family and friends, or as a foundation to begin to explore professional training and practice. The first level of the Essential Level Certification, in this 5 day training you will study, practice, and receive a comprehensive 90 minute Thai Yoga Massage. Open to anyone wishing to develop the skills to build a professional practice. In this 5 day training you will have a complete review of Level 1, plus learn another 90 minutes of techniques including the side lying sequence, and learn how to customize a massage for the individual. Upon completion receive your Essential Level Certification. This 3-day course teaches 60 minutes of new Thai Yoga Massage techniques which you can customize according to a person’s body-type. This program focusses on new twisting stretches, and how to incorporate use of knees as a massage technique. Open to practitioners who have completed their Essential Level Certification or equivalent (bridging program available). This 3-day course teaches 60 minutes of new Thai Yoga Massage techniques which you can customize according to a person’s body type. This program focusses on learning how to identify and massage 18 marma points (vital energy points) & their healing properties. How to create a customized 2-session Thai Yoga Massage wellness program incorporating massage sequencing, as well as nutritional, lifestyle and yoga recommendations according to a person’s body-type. Wear comfortable, stretchy clothing; preferably long pants and a t-shirt. Bring note-taking materials, water bottle, lunch/snack. Anyone can take the Taster and Level 1 Practitioner Training programs; they are great skills to share with family, friends, yoga students or clients. Level 2 and all Continuing Education programs are available to those who have completed the Level 1 Practitioner Training program. These courses are ideal for yoga teachers, fitness professionals and massage practitioners wanting to diversify their services, but also are open and accessible to anyone who wishes to share the power of touch. Can I Get Insurance to Practice? If you are already insured as a yoga teacher or body worker, the process is simple and usually no additional cost to add Thai Yoga Massage to your policy. For instance in the case of OAMPS, Thai Yoga Massage is a recognized modality and adding this to your policy is free. Check with your insurance provider for more information. If you do not carry insurance as a yoga teacher or bodyworker, check out membership organizations like www.iict.com.au to see if you qualify for membership and insurance. Can I Use This Course to attain CPD or CEC points? Can I Practice Professionally After Taking This Course? Absolutely. If you are already a certified massage, yoga or fitness professional you can practice after taking Level I, providing your insurance provider has a cover for Thai Massage. If you do not have prior training, you may need to increase your knowledge and training level through further levels of Thai Yoga Massage, Yoga Teacher Training, or Massage Training. Check out the local governing bodies in your area for training requirements. In Australia, the professional organizations include IICT, ATMS, MAA, AAMT, and Yoga Australia. Your courses will be facilitated by Heather Agnew, an internationally recognized senior yoga educator and Thai Yoga Massage instructor. 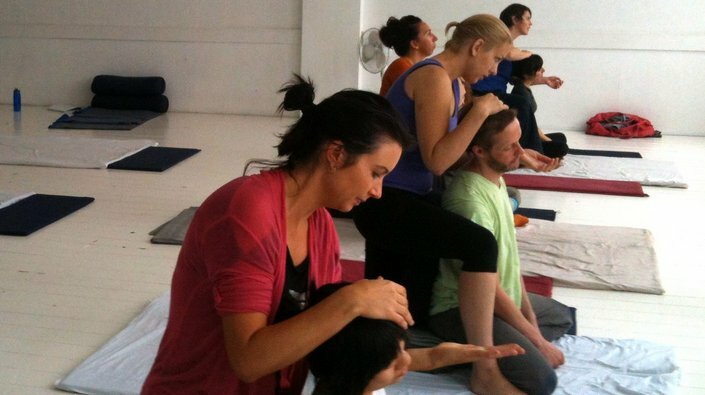 Heather has more than 10 years experience practicing and teaching Thai Yoga Massage, and has facilitated over 60 successful courses in Canada and Australia. Learn more about Heather Agnew.